Well, we made it through another wonderful season of Brandeis Summer School. Although we’re looking forward to the fall foliage, we’re sad to see summer end. This year, we had an incredible group of Teaching Assistants, Program Assistants, and Activities Staff – and we’re grateful for their work to make this year a success. We’ll spend our fall looking ahead to Summer 2019. If you have classes you’d like to see, improvements you’d like to suggest, or questions you’d like answers to, please email us at summersc@brandeis.edu. We’re always happy to hear from our students. We hope you’ll join us again next summer – and until then, best of luck with your studies! Brandeis Summer School gladly offers a variety of activities throughout the summer. These events are free to students and are offered throughout the summer sessions. We do our best to offer these programs on various days, at various times, and to cater to various interests. We design these activities to provide students with an opportunity to interact with their peers as well as the community around them. We realize our summer courses are academically challenging, and these activities are scheduled to help give students a study break. Earlier this summer, we took a group of students out to Six Flags. Later this season, we’ll head to the beach. We offer regular trips to local grocery stores, host trivia nights, welcome ice cream trucks to Brandeis, and get students off campus and into the city. If you’re on campus for the summer and interested in participating – whether it be on a kayaking trip or games on the field – email the Brandeis Summer School at summersc@brandeis.edu to learn more. With finals in full swing for Brandeis Summer Session II, you might be searching for a study break. You might also be searching for some good food! We have the perfect solution. 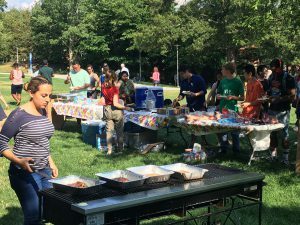 Join Brandeis Summer School for a BBQ on Tuesday, August 9 at 4pm in front of the SCC. We’re expecting a crowd, so be sure you come early! We’ll have burgers, hot dogs, and kosher options! Congratulations on all your work this summer, and best of luck with your finals! We look forward to learning with you again next year. This past Friday we kicked off Summer 2016 Activities! 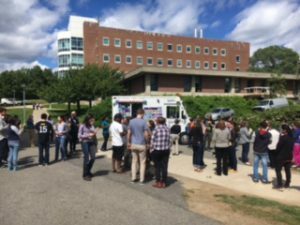 We welcomed an ice cream truck to campus and took a break to connect with colleagues and students from all across Brandeis! Join us today at 4:30pm in Gosman for pick-up basketball! Considering an ECON major or minor? Start your study with ECON 10a! Get online and get outside this summer! BIOL 26A: Plant Biology – Offered Online this Summer!